D-1189, White Color, Hindu Cards. 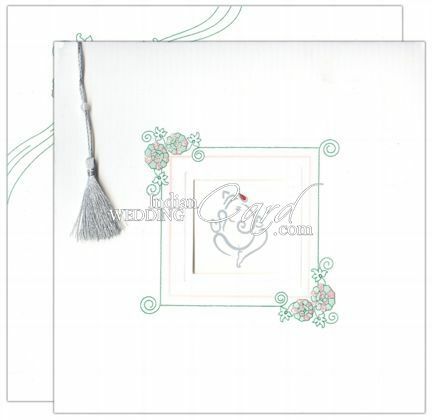 Another artistic card, the Front windows shows the ganeshji which is actually printed on the Inside band shaped pocket which holds the 2 inserts which are tied together with silver tassel. The inserts are printed with multicolor floral border. 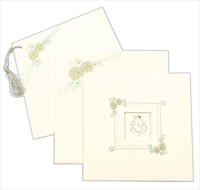 Mailing envelope follows the insert floral design. White self lined paper (225gsm) for Card and 2 inserts. 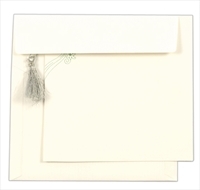 White 120gsm paper for Mailing envelope. Silk Screen Printing in Color matching to card or any Dark color or Gold. Add on card paper will be generic color (White) with design to match chosen card.